Are your parachute landings not as nice as you’d like? Have they gotten a little worse over time? The problem may be with the pilot… but then again, it might be with the brake lines you use to control your parachute. 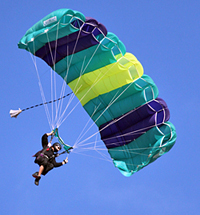 As the parachute opens, the friction from the slider grommets traveling down the lines heats the lines, and over time and hundreds of openings, the heat will gradually shrink the outside and brake lines of your canopy. Also, as you land and drop your toggles, twists commonly occur if you don’t stow your toggles straight on your risers right away. These twists add up quickly to shorter brake lines as well. The result? Your canopy will be more “cupped” and not fly quite as efficiently as it was designed to do. Also, your shortened brake lines might be pulling down the tail in full flight, reducing the speed your canopy needs for lift to flare at the ground. How do you know if your brake and outside lines are too short? For your brake lines, take a look at your canopy on your next jump. With your hands all the way up, are your brake lines tight? If so, they need to be let out. If you see twists in your brake lines, simply untwist them before your next pack job; I prefer to untwist mine before my last packjob of every day. For your outside lines, take your canopy up to the loft and get the lines measured. You’re in luck, the Skydive Spaceland loft is offering free main inspections with your reserve repack through January (a $15 value)! 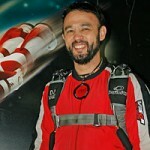 DJ Marvin is a career skydiver, USPA Coach Examiner, USPA Accelerated Freefall Instructor/Examiner, USPA/UPT Tandem Instructor/Examinar, Canopy Coach, and owner of The Ratings Center.